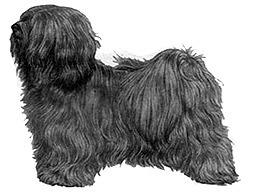 Sturdy, medium sized, long haired, generally square outline. Balanced, without exaggeration. Lively, good natured. Loyal companion dog with many engaging ways. Skull of medium length, neither broad nor coarse, narrowing slightly from ear to eye, neither domed nor absolutely flat between ears. Zygomatic arch curved, but not overdeveloped so as to bulge. Marked stop in front of eyes but not exaggerated. Muzzle strong; well developed lower jaw. Length from eye to tip of nose equal to length from eye to occiput. Nose black. Head well furnished with long hair, falling forward but not affecting the dog's ability to see. Lower jaw carrying small, but not exaggerated amount of beard. In all giving a resolute expression. Pendant, carried not too close to head. V-shaped, not too large, set fairly high on the side of the skull, heavily feathered. Scissor or reverse scissor bite. Incisors set in a slight curve, evenly spaced and set perpendicular to jaw. Full dentition desirable. Heavily furnished. Shoulders well laid, with good length and slope of upper arm. Legs straight and parallel; pasterns slightly sloping. Smooth, effortless stride with good reach and powerful drive. When walking or trotting hind legs should track neither inside nor outside the front legs. White, golden, cream, grey or smoke, black, parti-colour and tri-colours; in fact any colour except chocolate or liver permissible.